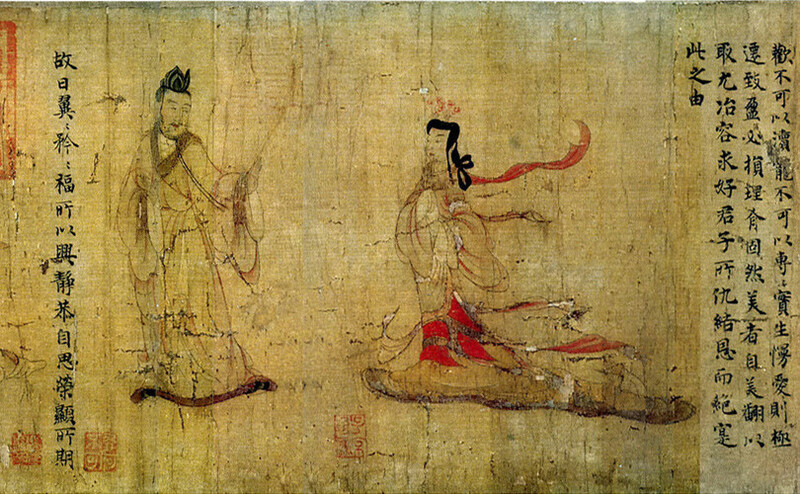 This painting illustrates a political parody written by Zhang Hua (張華, ca.232–300). The parody takes a moralizing tone, attacking the excessive behavior of an empress. The protagonist is the court instructress who guides the ladies of the imperial harem on correct behavior. In total, nine scenes were depicted on this scroll, but it is now incomplete; the first two scenes are missing, as well as the text to the first scene. This painting has been executed in a fine linear style that is typical of fourth-century figure painting. Similar pictorial motifs have been discovered in contemporary tombs. Texts describe Gu Kaizhi as having painted in this manner. The inscriptions and seals on this scroll date back to the eighth century, when this copy of Gu Kaizhi’s original was probably painted. Before its arrival at the British Museum in 1903, the scroll passed through many hands. The history of the painting can be ascertained through the seals and inscriptions, beginning with the eighth-century seal of the Hongwen Guan, a division of the Hanlin Academy. The painting was subsequently in the collections of well-known connoisseurs who added their own seals and inscriptions, before ending up in the imperial collection during the reign of the Qianlong emperor (r.1735–96). In 1860, during the Second Opium War, the painting was looted by British troops from the Old Summer Palace and eventually came to the collection of the British Museum.